Can Social Media Save Detroit? The Rapid Decline in Pictures. One old cliché is a picture is worth a thousand words. Perhaps these photos that are currently spreading across social media will in some way provide a positive benefit for Detroit. As Detroit has struggled financially, the national news media has prominently reported it slipping into bankruptcy. However, once the news cycle was over, the story quickly dropped from national headlines. The images presented appear to show the same location but at intervals spread out across time. 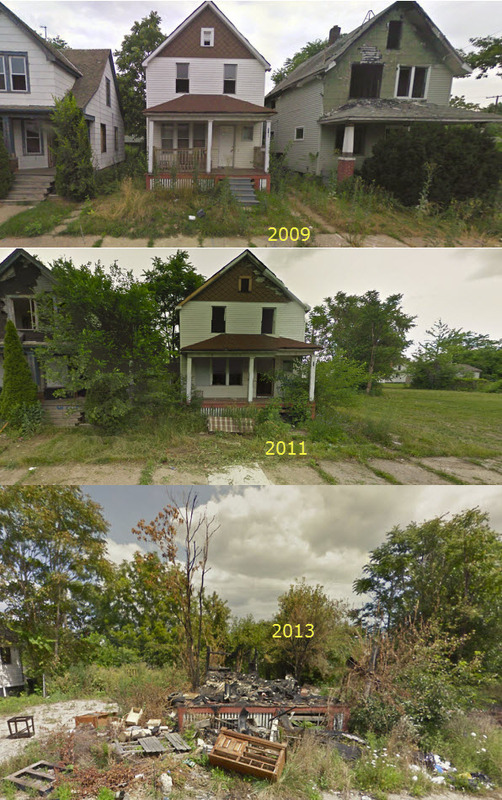 Within just a couple of years, homes go from livable to decrepit. Homesteads are transformed from neatly trimmed yards to abandoned plots with wild, over-grown weeds and crumbling infrastructures. Some homes completely disappear. It also appears to have somewhat of a domino effect. Once one house is lost, revisiting the street over the next couple of years show that the blight tends to spread to adjacent houses too. Unfortunately this is not a new issue. Back in the mid 1970’s, New York City almost went bankrupt. The blight that spilled across the city was significant. If you drove to Yankee Stadium in the late 1970’s, you would see abandoned buildings by the dozens. The irony was that some entity (the City? ), had closed up the windows with what appeared to be aluminum and painted a flower pot in each window. While this was akin to putting lipstick on a pig, it did make the area look less depressing if that was possible. If you never drove through the Bronx, you would have no clue about the breadth of this problem. That was the 1970’s, when there were about 7 channels available on your television. During that era, a crumbling city (even a major one like New York City) could be keep its blight out of sight and out of mind. Today with the communication capabilities impacting every element of our lives from social to political and everything in between, the power of social media is immense. From the Arab spring to the rapid downfall of politicians who careers are jeopardized by an inappropriate tweet to today’s reality stars, social communication has the power to create rapid change. The question I leave with is this, Detroit is falling apart and it is being documented for all to see. Can social media provide any help?